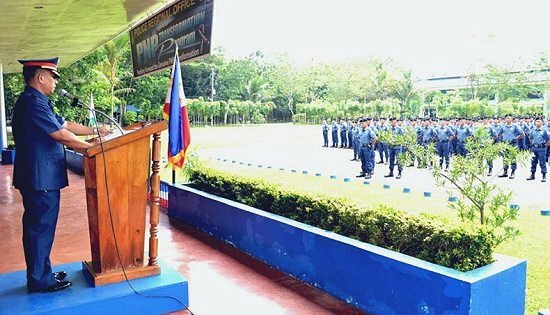 PCSupt Elmer Ragadio Soria, Police Regional Office 8 Director addressing the participants during the Closing and Opening Ceremony of the PNP Scout Class 17-2012 and 18-2012, respectively at the PRO8 Grandstand. CAMP SEC. RUPERTO K. KANGLEON, Palo, Leyte – “Being a police officer is not about what you can or cannot do, it’s about what you should do”. This was the reminder of Police Regional Director PCSupt Elmer Ragadio Soria to his men as the Police Regional Office 8 today held the Joint Opening and Closing Ceremony of the PNP Scout Training at the PRO8 Grandstand. Soria exhorted the active role of the PNP in the anti-insurgency campaign, and the need to initiate aggressive campaign against criminalities and terrorism even as he expressed the corresponding need to further enhance the PNP’s Internal Security Operations (ISO) capability. “Enforce the law with respect to human rights as you transform yourselves into professional internal security specialists with the best interest of the community foremost in your hearts”, the Regional Director said. He also encouraged the next batch of trainees to make the most out of the special training, participate in all undertakings, and make a genuine effort to improve themselves. A total of 195 police personnel have officially completed the PNP Special Counter Insurgency Unit Training (PNP SCOUT) under the SCOUT Class 17-2012 while 187 others will start training under the SCOUT Class 18-2012 to be held at the Regional Special Training Unit 8 (RSTU8). The PNP SCOUT is a rigid 45-day training designed to equip police officers with the requisite skills and confidence that will give them a distinct advantage in counter-insurgency and local terrorism operation. The training puts premium on combat skills development, jungle fighting and survival techniques and also teaches the participants the principles and techniques of urban crisis response operations primarily on search and rescue (SAR), and police intervention preparedness. Soria added that aside from maintaining peace and order, it is also the PNP’s duty and responsibility to secure public safety, including responding to emergencies during calamities. “We make sure that every PNP personnel deployed is ever-ready, capable and efficient in handling his duties and responsibilities,” Soria disclosed. The new SCOUT graduates will be assigned to the Regional Public Safety Battalion (RPSB8), PRO8’s maneuver unit primarily tasked to confront and eventually end the insurgency problem in Eastern Visayas region. CAMP LUKBAN, Catbalogan City – The 8th Infantry (Stormtroopers) Division, Philippine Army joins the Office of Presidential Adviser on Peace Process (OPPAP) in inaugurating P30M road project from Brgy Nenita, Mondragon, Northern, Samar, yesterday September 19, 2012. 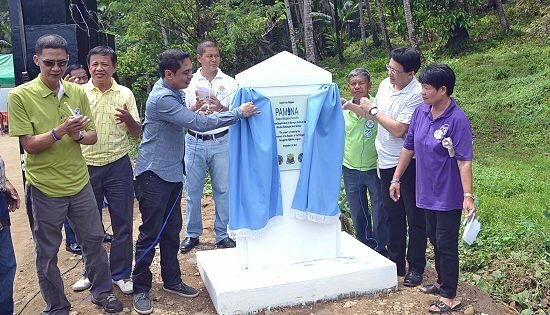 The Payapa sa Masaganang Pamayanan (PAMANA) Road Project from Mondragon to Silvino Lubos, Northern Samar is part of the Pillar 3 Program which is intended for priority road networks in the Province. The activity was graced by Mr. Luisito Montalbo, OPPAP Undersecretary. Also in attendance were Hon Paul R Daza, Governor, Northern Samar; Hon Ismael C. Bugna, Mayor, Mondragon, Northern Samar; Ms Aileen Jose, OPPAP Director Luzon-Visayas; Col Virgilio M Espinelli, Assistant Division Commander, 8ID; Col Mario Lacurom, Deputy Brigade Commander, 803rd Infantry Brigade, 8ID, PA; PSSupt Isais B Tonog, Provincial Director, Northern Samar Police Provincial Office; Mr Romeo M Cardenas, Provincial Planning and Development Coordinator. Other PAMANA Areas in the Province of Northern Samar covers three municipalities namely: Las Navas, San Roque and Silvino Lubos, and by 2013, Pillar 2 Program which is KALAHI-CIDDS Program will be covering the Municipality of Lope De Vega. Usec Montalbo stated that, the PAMANA road project in Mondaragon stretching to Silvino Lubos is one of the prioritized project of OPPAP in the Province and the rest of Region 8, through this project will give our full commitment to Gov Daza to finish this road network until it reaches the Municipality of Silvino Lubos. “We all dream that one day, there will be no more Filipino killing another Filipino because of ideology, and according to His Excellency Benigno Simeon C Aquino III, we all dream to have a country with a just and lasting peace” added Montalbo. “We all dream that one day, all communities in the country like the Municipality of Silvino Lubos will not only be developed but rather have a peaceful community,” Montalbo further added. MGen Gerardo T Layug AFP, Commander, 8ID, PA states that the 8ID will fully support all peace and development initiatives of the government and other cause-oriented groups as part of the AFP’s Internal Peace and Security Plan ‘Bayanihan’ which seeks to enjoin all stakeholders to work together and help attain peace and development in every community. Before the start of the inauguration program, the attendees led by Usec Montalbon and Gov Daza participated in the Plant for Peace activity at Brgy Nenita, Mondragon, Northern Samar as part of the Peace Month Celebration in the country. Aside from the road projects implemented by OPPAP, the government also gives opportunity to Former Rebels to voluntarily surrender to the government and avails the Local Social Integration Program. 8ID and OPPAP together with the Local Government of Northern Samar will continue extending its support to all conflict affected areas as well as to Former Rebels who opted to join the mainstream society. CAMP SEC. RUPERTO K. KANGLEON, Palo, Leyte – The PNP Police Regional Office 8 (PRO8) gained headway in its anti-illegal drugs campaign throughout the region with the arrest of six drug pushers during separate anti-illegal drugs operations that also resulted in the confiscation of several short firearms. “The drug problem will always remain as one of the primary concerns of Police Regional Office 8. We clearly emphasized to our operating units that complacency in the conduct of anti-drug operations will only burden the PNP with the social costs of the continuing drug problem that are highly correlated with criminality. Thus, all line units were ordered to sustain an intensified police operations against illegal drugs”, Police Regional Director PCSupt Elmer Ragadio Soria said. The Regional Director added that PRO8 had revitalized the implementation of its existing strategy against illegal drugs to further strengthen its capacity to carry-out holistic and coordinated operations in support of the PDEA. The objective of this strategy, Soria added, is to suppress the flow or trafficking of illegal drugs through the conduct of sustained anti-illegal drug operations such as Buy-bust, Search and Seizure, Mobile Checkpoint Operation, Airport/Seaport Interdiction, Controlled Delivery, Undercover Operation, Narcotics Investigation, Barangay Clearing Operations and other similar police operations. Soria informed that in the afternoon of September 18, 2012, at Brgy Magbagacay, St. Bernard, Southern Leyte, elements of Southern Leyte PPO, St. Bernard Municipal Police Station and PDEA8 led by PSInsp Delfin Tan and PSInsp Gregorio Nitura conducted buy-bust operation and implementation of Search Warrant which resulted to the arrest of one Geovanie Vasquez y Bonador alias Geo, 33, married, entrepreneur and a resident of Brgy. Magbagacay, St. Bernard, Southern Leyte and listed as Number One drug peddler/pusher in the municipality of St. Bernard. Confiscated from his actual possession and control during the conduct of buy-bust operation were the following: one sachet of heat-sealed transparent plastic cellophane containing white crystalline substance suspected as “shabu”, two pieces P500.00 peso bill buy-bust money; one MyPhone mobile phone and one piece lighter. Seized during the implementation of search warrant were one unit .45 caliber pistol Colt MK IV Series 80; one unit Smith & Wesson .357 magnum caliber revolver; one (1) unit .45 caliber empty magazine; four pieces .38 caliber ammunition; five pieces .45 caliber ammunition and several drug paraphernalia. The confiscated items were properly documented at the scene duly witnessed by Barangay Officials led by Hon. Gilbert Gamutan, Brgy Captain of Brgy Magbagacay, St. Bernard, Southern Leyte. Also in the afternoon of September 18, 2012, team led by PCInsp Ibrahim Jambiran, Chief, AIDSOTF/Intel Officer of Ormoc City Police Office conducted buy-bust operation at Brgy Nadongholan, Ormoc City which resulted to the arrest of a certain Gregorio Oliverio y Garcia, 42, married and resident of the same place and Elmer Concon, 46, married and resident of Aquino Village, Brgy Cogon, Ormoc City. Confiscated from the actual possession and control of Oliverio were: one piece medium heat sealed transparent plastic sachet containing suspected shabu; two pieces small heat-sealed transparent plastic sachet containing suspected shabu, one piece P500.00 peso bill marked money and P650.00 in different denominations. Recovered in plain view at the top of a small table in the living room were: One unit caliber .45 pistol (COLT’s government model) bearing serial number 342614; two magazines for caliber .45; five live ammunition for caliber .45; one improvised shotgun with marble bullet and several drug paraphernalia. At the time that the other members of the team were swooping down the house, Concon was also arrested when he was caught in the act tucking a gun and running away from the house. Upon the arrest, the item turned out to be a caliber .38 Smith & Wesson revolver without serial number loaded with five live ammunition. Meanwhile, in Naval, Biliran province, joint elements of Naval Police Station, Biliran Police Provincial Office and PDEA led by PInsp Rogelio Llaneta conducted buy-bust operation in Brgy. PI Garcia of said town that resulted in the arrest of one Ian Caneja y Ang, single, jobless, resident of Castin St., Brgy SMO Rosario, Naval, Biliran. The team seized from the suspect one sachet shabu worth P1,000; buy-bust money of P1,000 bill with Serial No. GB711720, one Nokia 1208 mobile phone; P17,000 assorted bills believed to be drug proceeds and one unit Yamaha Crypton 125 motorcycle with Engine No. ETN 405302. Relatedly, at Brgy. San Jose, Sogod, Leyte, joint elements of Sogod Police Station led by PSInsp Alfred Reynald Dauz and CIDG led by PSInsp Ferdinand Mendoza buy-bust operation which resulted in the apprehension of Efren and Eduardo dela Victoria, both residents of Brgy. Suba, Sogod, Southern Leyte. Confiscated from Efren dela Victoria were one small heat-sealed plastic sachet containing “shabu” weighing 0.08g; one medium sachet of shabu weighing 0.20g; P500 bill with serial number RF665330 buy-bust money; MyPHone mobile phone; one .357 caliber paltik revolver with 3 live ammunitions and drug paraphernalia. The police also seized from Eduardo dela Victoria one small heat-sealed plastic sachet containing “shabu” weighing 0.06g; marked money worth P500 in different denominations and one unit Beretta caliber .9mm pistol bearing serial number SN MO5391Z with 5 live ammunition. The Regional Director added that appropriate drug charges and illegal possession of firearms were filed against the suspects. “PRO8 will continue to hit hard on organized crime groups behind the trafficking of illegal drugs in the region in support of the national anti-drug campaign and the PNP LOI “Kontra Droga Charlie”, Soria averred. The PNP high command issued Letter of Instruction “Kontra Droga Charlie,” setting forth in the PNP’s anti-illegal drugs strategy to further strengthen its operational support mechanism to PDEA in the national anti-drug campaign consistent with the intent of Executive Order No. 218. Saguitan’s relatives found his body mutilated by the perpetrators, identified as members of the Civilian Armed Force Geographical Unit (CAFGU) attached to the 26th IB Detachment in Sitio Tambo, Brgy. Binikalan, San Luis Agusan del Sur. His body was on the road side, some 130 meters away from the detachment of the 26th IB in Sitio Tambo. According to the report sent to Karapatan, Almira, Saguitan’s wife who is eight months pregnant with their first child, “wept while cleaning his husband’s body” when she saw the two gunshot wounds in his right chest and another two gunshot wounds in the hip area, near his spine. His face and chest were covered with bruises. Ambason’s teeth are all gone. His head was deformed, and his face unrecognizable because of the bruises due to heavy beating. The report indicated that, prior to the incident, Saguitan and four others were on their way to Sitio Tambo, Brgy. Binikilan to mine and buy gold. He had with him 18,000 pesos in cash. They were riding a motorcycle but decided to hike uphill when the motorcycle broke down. Some 200 meters away from Sitio Tambo, Ambason and his group decided to rest as they were already exhausted from hiking. From where they rested, they could see the detachment of the 26th IB; and those at the detachment could also see them. A few minutes later, they heard footsteps approaching them. Upon hearing this, Ambasong immediately stood up and pointed his flashlight to where the sound was coming from. But as soon as he turned on his flashlight, they were immediately fired at. A series of shots fired also came from the direction of the detachment. Ambason’s companions ran to different direction toward the forest, leaving behind Ambason, who could no longer move because of gunshot wound. That was the last time he was seen alive. His wife would later find out that the P18,000 he was carrying was lost. Ambason was active in the anti-mining campaign in the area of San Luis. The CAFGU, according to the residents in the community, were deployed in the area because of the anti-mining campaign. Ambason was also involved in the anti-militarization campaign which he believed has brought about a string of human rights violations among his fellow Lumad. CALAMBA, Laguna – In an action to expose industry polluters that “kill” Laguna Lake, Greenpeace activists today labelled the fence of TNC Chemicals Philippines with the words “Water Polluter”. They also unfurled a banner listing the different hazardous chemicals previously identified in a sampling report by the organization as the recipe for the toxic pollution in Laguna Lake. Laboratory results confirm the presence of heavy metals chromium, nickel, and copper above background levels for normal uncontaminated surface waters. Another sample showed high concentrations of a variety of carcinogenic organic compounds as well as some carboxylic acid esters. “Industries that dump toxic chemicals are depriving Filipinos of clean and safe water. What the results show is that there are far too many chemicals that find their way into our water without our knowledge. Worse, these chemicals such as the ones we found in the samples from TNC discharge pipes, are not routinely tested by government,” said Beau Baconguis, Toxics Campaigner for Greenpeace Southeast Asia, Philippines. The labelling of TNC’s facility was part of the series of activities highlighting industrial pollution under Greenpeace’s “Right-to-Know Water Patrol Expedition”. The expedition, launched this month, aims to expose water polluters, investigate and document potential polluters along Marikina River and Laguna Lake, and draw support for the enactment of policies to bring down toxic pollution to zero levels. Greenpeace has been calling on the Department of Environment and Natural Resources (DENR) to 1) expand the Priority Chemicals List to include substances that have been proven to be toxic, 2) immediately phase out these hazardous chemicals with specific timelines, and 3) establish a pollution disclosure system. “The fact that only five (5) chemicals are regulated under RA 6969, demonstrates the lack of capacity and political will to implement the law. Lamentably because of government’s inaction on hazardous chemicals, it is the public and the environment that suffers,” added Baconguis. Meanwhile, Greenpeace calls on TNC Chemicals Philippines and other industries to stop dumping toxic chemicals into water bodies, to take responsibility for their pollution and disclose the chemicals they use in their production. Baconguis reiterated that the government must be able to take urgent legal action against errant companies such as TNC. “As a long term solution, DENR must work towards a Zero Discharge policy for industries,” she concluded. QUEZON CITY – On the eve of the 40th year of the imposition of martial law, victims of human rights violations under the Marcos dictatorship pressed on their fight for justice and indemnification as they rallied once more at the foot of the historic Mendiola Bridge. Senator Chiz Escudero has, on many occasion, said that the report by Committee on Justice and Human is ready for the plenary debates. “We have received the same reply for the longest time. Is the government serious about this? Or are the senators intimidated by the presence of a Marcos in the Senate,” Ilagan asked. SELDA is also apprehensive with some of the provisions in the bill that they believe do not reflect the interests of the ML victims. Thus, it reiterated its earlier position, among others, the recognition of all 9,539 victims and class suit plaintiffs who won the case against Marcos both in the US and in the Swiss courts. SELDA members believe that the passage of the indemnification bill into a law is a step towards justice, “not so much for the compensation but more importantly, the recognition that injustice was committed to thousands of people during martial law. This should serve both as a reminder and a warning to all the administrations that people will not take injustice blindly. As proven in our recent past, there are many other avenues to pursue justice,” said Ilagan. “We have no material wealth to pass on to our children and families. But so long as oppression and exploitation remain, this undying fervor to struggle for what is right and just will be our legacy to them and to the Filipino youth. Tuloy ang Laban! (The struggle lives on! )” they concluded.